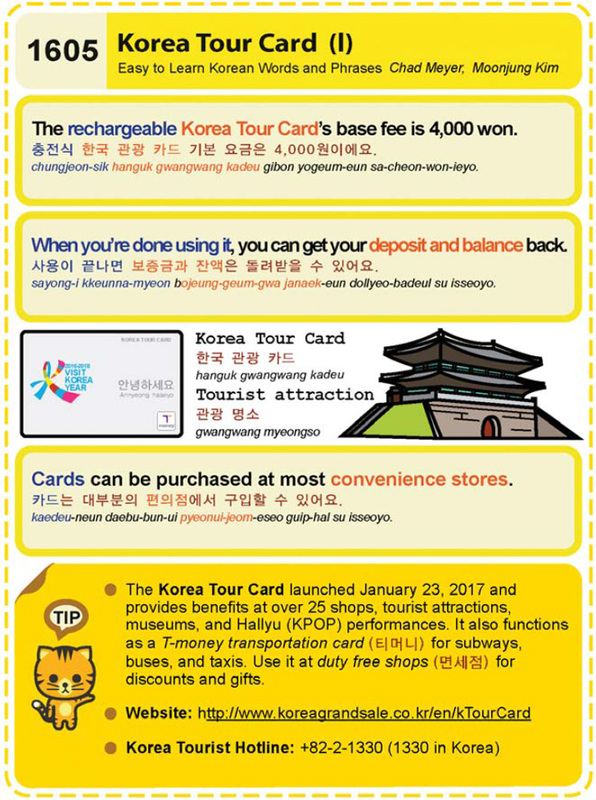 Easy to Learn Korean 1605 – Korea Tour Card. This entry was posted in Series and tagged 000Won., 000원이에요., and Hallyu (KPOP) performances, and taxis, buses, Cards can be purchased at most convenience stores., duty free shops, Korea Tour Card, Korea Tourist Hotline, museums, shops, subways, T-money transportation card, The rechargeable Korea Tour Card’s base fee is 4, tourist attraction, tourist attractions, When you’re done using it, you can get your deposit and balance back., 관광 명소, 면세점, 사용이 끝나면 보증금과 잔액은 돌려받을 수 있어요., 충전식 한국 관광 카드 기본 요금은 4, 카드는 대부분의 편의점에서 구입할 수 있어요., 티머니, 한국 관광 카드 by easykorean. Bookmark the permalink.